In an interview taped last August, singer Rachel Platten talked to me about her second album with Columbia Records, “Waves,” which came out last October. She started her career by teaming up with Semi Precious Weapons lead singer Justin Tranter and writing big hits for Justin Bieber, Selena Gomez and Hailee Steinfeld to name a few. 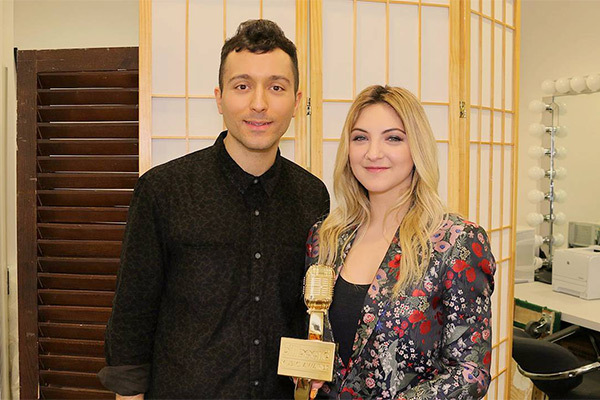 But since deciding to keep the song “Issues” for herself and become an artist, Julia Michaels has gotten to experience a whole new side of the music industry. On Monday morning, she had the chance to check another box off the list: live TV. Michaels’ first time in front of the camera without the safety net of a pre-tape came on ABC’s “Good Morning America.” She and Fall Out Boy’s Pete Wentz revealed nominations for the 2017 Billboard Music Awards. Michaels was thankful to have Wentz there though, a seasoned-pro at these things, to help her along. Despite Tranter penning FOB’s “Centuries,” it was the first time the two artists had met. Speaking of the nominations, The Chainsmokers and Drake took home the most, ever. Both acts tied the single-show nod record at 22 apiece. Twenty One Pilots checked in next on the list with 17, followed by Rihanna’s 14. Immediately, the light bulb went off for Michaels. The song was co-produced by Skrillex and features singer Halsey, who coincidentally also scored 7 BBMA nods. As for Michaels’ solo project, the singer is still pretty happy she made the decision to release the super-personal song “Issues” with her own voice. Michaels recently released the music video for the single and tells me that while originally thinking it would be followed by an EP, she may now opt for a full-length album because of the amount of writing she has done. And yes, she’ll be at the 2017 Billboard Music Awards, which air Sunday night, May 21 at 8 pm live from T-Mobile Arena in Las Vegas. One Direction learned last week that American media can rival European outlets in aggressiveness when it comes to prying open the personal space of celebrities. The boy band performed on ABC’s “Good Morning America” for the show’s summer concert series in Central Park, a day ahead of headlining MetLife Stadium in East Rutherford, N.J. In addition to singing the new single, “Drag Me Down,” all four gentlemen sat down for an interview with hosts Michael Strahan and Lara Spencer. It was a rather run-of-the-mill interview until about two and a half minutes in. “Well I gotta say Louis, from one father to another, I want to congratulate you on your upcoming fatherhood,” Strahan lobbed in the direction of Louis Tomlinson. People Magazine reported a few weeks ago that Tomlinson was expecting a child with Los Angeles stylist Briana Jungwirth. Despite a number of outlets following suit with various updates citing numerous sources, the closest anyone got to a confirmation was a radio interview in which band mate Liam Payne said how excited he was for Tomlinson. 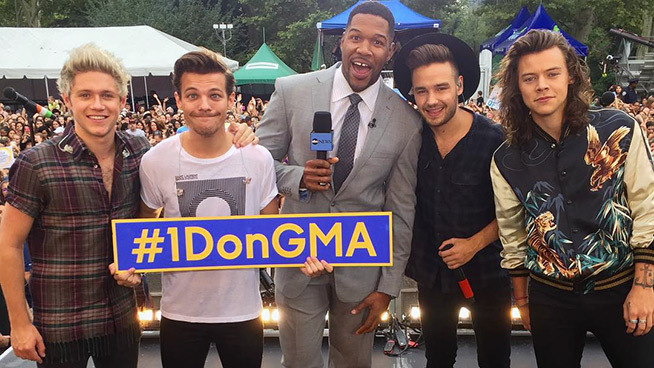 But last Tuesday, the collective reaction of 1D told the story: the guys looked stunned, and clearly were taken aback that Strahan would force Tomlinson to confirm the news in front of a live, national TV audience. The guys then went over six seconds – feeling closer to eternity – without speaking. Spencer broke the silence by noting Harry Styles seemed a little quiet. Waking up at the crack of dawn to perform on a show, only to have two of the show’s hosts attempt to get your best friend to break his silence on a pregnancy sounds like a lovely way to spend a Tuesday morning. We don’t know how far along Jungwirth is in her pregnancy, nor do we know if she has had any complications to this point. I pray she has not, but regardless it’s none of our business. And if Strahan really wanted to congratulate Tomlinson “from one father to another,” he would have done so from one man to another, when the cameras weren’t rolling. Even when Taylor Swift is wrong, she eventually gets it right. The pop star is no stranger to controversy, deservedly or not. But we’ve grown accustomed to Swift not only entering the fray on her own terms: penning a Wall Street Journal op-ed piece, removing her music from Spotify, opining to Apple Music via Tumblr – but also entering in order to right a perceived wrong. Swift set out to correct a few misnomers with her latest album, one of which was that albums still have value. Over five million albums sold later, it’s clear they care. The LP has also spawned a few GRAMMY nominations, a slew of hardware at May’s Billboard Music Awards and now nine MTV Video Music Award nods. All but one of Swift’s nominations are for the “Bad Blood” music video, which premiered at the start of the aforementioned BBMAs and features Kendrick Lamar a slew of celebrities/Swift’s “squad.” The piece broke Vevo’s 24-hour view record, previously held by Nicki Minaj’s “Anaconda” video. But unlike “Bad Blood,” Minaj’s video didn’t receive a “Video Of The Year” look. Enter, controversy. Minaj took to Twitter and voiced her displeasure over the snub, noting that when “’other’ girls drop a video that breaks records” and it “celebrates women with very slim bodies,” you receive a VOTY nomination. 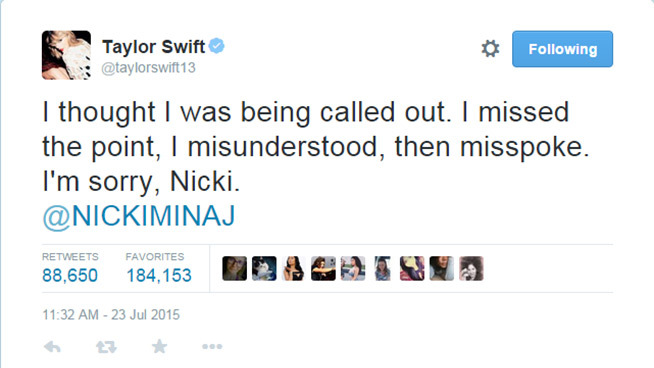 Swift perceived the tweets as a direct jab and responded by reminding Minaj that she’s done “nothing but love and support” her, and that it’s unlike the rapper “to pit women against each other.” The “Shake It Off” singer later tweeted that she would want Minaj to join her on stage if “Bad Blood” wins. However for once, Swift was wrong. Minaj didn’t care about “Bad Blood” and probably isn’t overly concerned with winning another Moonman. The emcee was speaking to the racial and social injustices that still exist in the music industry. And if anyone gets that, it’s Swift, who is about as a good of a role model as you’ll find in the public for young women. According to Minaj, the two singers spoke on the phone and cleared the air. Swift also apologized on Twitter. American Idol finalist Allison Iraheta stopped by The RRS to play her new track and talk about her new LP, hitting stores on December 1.
and is suing mars for a breezy $6.5 mil. wow.